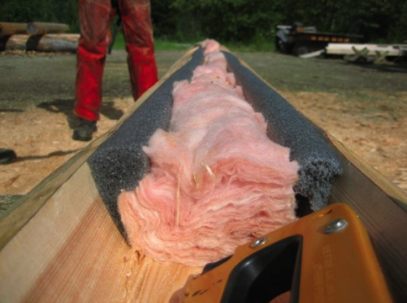 We are excited to be able to offer an exciting insulation alternative to handcrafted log home builders in the UK. P-gasket is a closed cell backer rod with a flange which makes it quick and easy to staple inside your lateral groove. P-gasket can work with any type of lateral, providing an excellent double barrier against the elements. P-gasket is water proof, does not react to stains and finishes and can be applied in the rain! The closed cell structure stops moisture and air movement and provides the perfect barrier against the elements. The large 30mm diameter easily compresses down to 10mm while still maintaining bounce. P-gaskets flange allows a simple way to secure your insulation in place without compromising the seal. An additional insulation of your choice is easily added in the center providing excellent protection, this can be either glass wool, sheep’s wool or a hemp insulation. The flange allows you to securely set the insulation at a height of your choice so you don’t have to worry about over cutting the shelf of your V or W groove. If P-Gasket is not the insulation you are looking for we also have a closed cell backer rod without the flange which can easily be used in a shallow groove or in a 3⁄4’’ shelf of a V-groove. It is also a great vapor and moisture barrier to router into the top of posts in a post and beam build or around windows and large truss joining’s. For more information and sales please feel free to give us a call. Let’s take the fight to the planning officials and prove that handcrafted log homes are homes for the future!